Kennel Club recognized Pug coat colours in UK are – fawn & black. Fawn pugs can come in many different shades, ranging from a pale clear colour, a pale cream, to a rich apricot colour, and all the shades of gold in between. 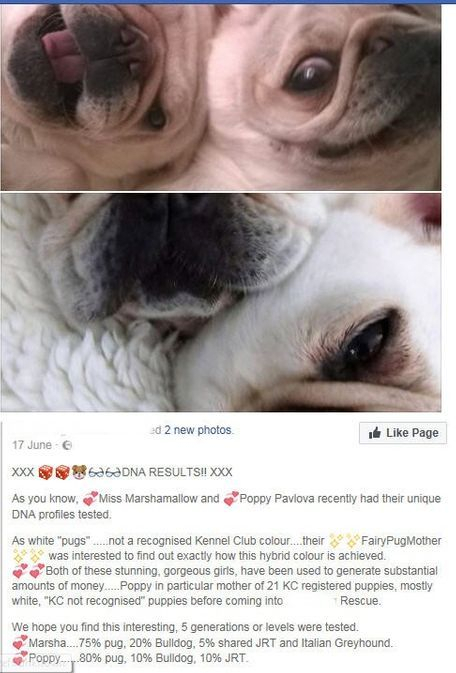 Every pug has two (a pair) of coat Colour genes’ that determines its colour.When we mate two Pugs, each parent will pass along one of their colour genes to the puppy, so each puppy is then born with its very own unique pair of colour genes. Fawn is a recessive colour gene,Black is a dominant colour gene.What this means is if a puppy was to inherit one black colour gene & one fawn colour gene the puppy would be black. The first is “True/Dominant black”,(homozygous) sometimes referred to as blue-black as in sunlight their coat has a dark blue-black appearance. True/dominant black pugs will have two black coat colour genes, and will always produce black puppies regardless of which colour they are mated with.(B/B). The second is a “Hybrid black”, (hemizygous) sometimes referred to as a rusty black. The hair on hybrid black pug can sometimes develop a brown or rusty coloured appearance in sunlight. Hybrid black pugs will have one black coat colour gene and one fawn coat colour gene.(B/f). A DNA coat colour test can be done to determine what combination of colour genes a black pug has. See link on the web sites & Info documents page for ordering coat colour Test. A dominant black pug bred to a hybrid black pug = black is the dominant colour in both parents, here therefore all pups will be black in appearance, however some will be dominant black (B/B), and some will be hybrid black (B/f). A hybrid black pug bred to another hybrid black pug = Hybrid black pugs have one fawn colour gene and one black colour gene. 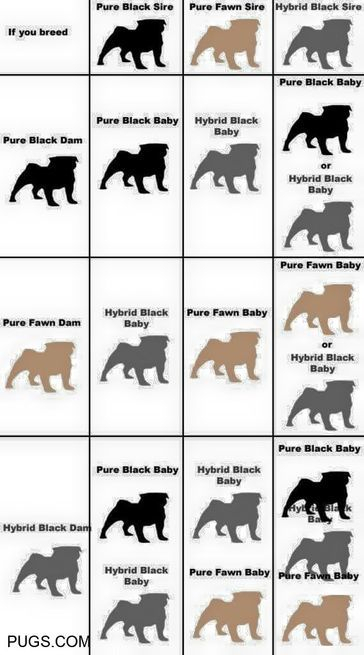 In THIS combination,there is no set pattern for how the colour genes are passed on, potentially it is possible for them to produce dominant black pups (B/B), hybrid black pups (B/f), and also fawn pups(f/f) in the litter. A dominant black pug bred to a Fawn pug = black is the dominant colour with this particular combination, therefore all pups will be hybrid black (B/f). A fawn pug bred to a hybrid black pug = hybrid blacks have one fawn and one black colour gene and are capable of passing either colour on to pups. Fawn pugs can only pass on fawn colour gene.So some pups may be fawn(f/f) and some will be hybrid black(B/f). A fawn pug bred to a fawn pug = all pups will be fawn (f/f). This combination cannot produce a black puppy as neither of the parents will have a black Colour gene to pass on to the pups. Some pure bred pugs,both fawn/apricot and blacks can ocassionally have white markings, most commonly found either on neck, chest or sometimes even on the feet.The gene for the white mis markings is totally separate from the genes that determine base coat colours.Any pug which carry`s this gene can produce fawn/apricot or black pups which have white mismarks. NOTE : Purebred Pugs ONLY come in Silver,Fawn/Apricot or Black. 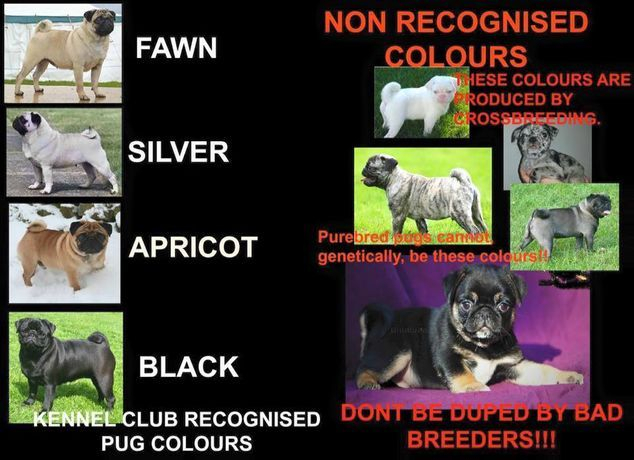 Any other colours such as Brindle,White,Platinum,Black & Tan etc will NOT be 100% purebred pugs.These non standard colours have been achieved by unscrupolous breeders crossing other breeds such as french bulldog, bulldog etc with the pug and then falsley registering the offspring as kc registered pugs in order to produce pups which look similar to pugs, but have different coat colours. This website and all its content is copyright © of Roxmarr pugs February 2013.